Please note, I do not keep a stock, as I offer most of my items in a choice of colours. Instead, I ask you to tell me the colour and pattern you want and then I knit it for you, so I need plenty of notice - 4-6 weeks for my larger shawls and 2-4 weeks for my smaller stoles and wraps. This way you can be sure getting exactly what you want. These beautiful wedding shawls, hand-knitted in fine 1-ply Shetland lace wool, are constructed the traditional way using my granny’s method, by first knitting the four borders and then attaching them to a middle section. Very similar to my christening shawls, but with a larger centre, I also use traditional Shetland patterns in these shawls, eg the ‘Tree of Life’, the ‘Cat’s Paw’ and the ‘Bead’, as well as my own interpretations and patterns, so each shawl will be slightly different and therefore unique to you. Although these bespoke shawls weigh less than 200g and can be pulled through a wedding ring (see picture right), they are surprisingly warm. Each wedding shawl takes nearly 200 hours to design and knit and therefore I need plenty of notice to create your very own heirloom - at least 8 weeks. These delicate wedding shawls could also be used as a christening shawl. Hand-knitted in 1-ply Shetland lace wool, this wedding shawl measures 60” x 36”, and features an original pattern, as well as a more traditional one and takes over 50 hours to complete. It has scallops at both ends and would be ideal to wear as a wedding veil, as it has an almost ethereal look. Hand-knitted in 1-ply Shetland lace wool; this wedding shawl measures approximately 20” x 50” and features the ‘Bead’ pattern throughout. It takes about 40 hours to complete and has a fringe at each end. Warm, but very lightweight, makes perfect for a wedding or other special occasion. 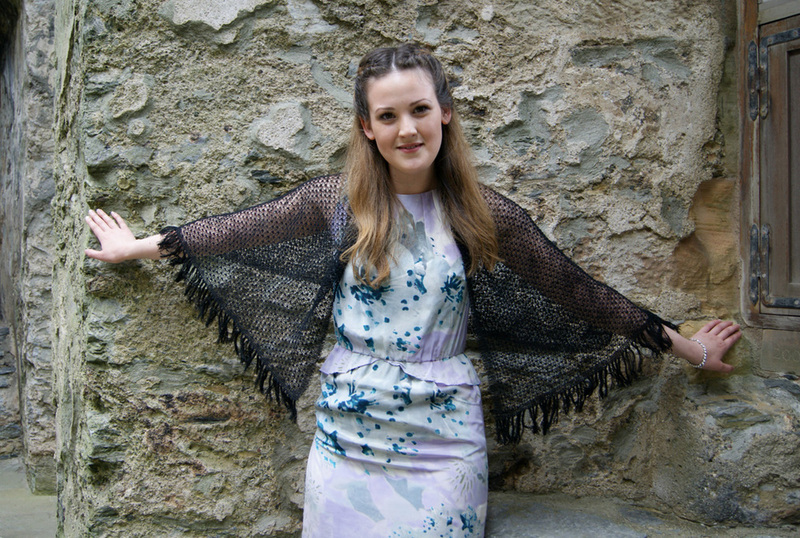 Hand-knitted in 1-ply Shetland lace wool, this luxurious feather-light wedding shawl features a combination of two traditional lace patterns, the ‘Cat’s Paw’ and the ‘Bead’ with a traditional scalloped edging. It measures 66” x 30”, takes over 50 hours to complete and would make an ideal accessory for a special occasion. Hand-knitted in 1-ply Shetland lace wool, this stole measures 40” x 20” and features the ‘Bead’ pattern throughout. It has scallops at both ends and takes about 35 hours to complete. Very lightweight and elegant, it would be ideal as a wedding shawl or accessory for another special occasion. Hand-knitted in 2-ply Shetland lace wool to my own design, this triangular shawl measures 40” along the top edge with sides measuring 20”. Taking approximately 25 hours to complete, it features the ‘Cat’s Paw’ pattern, has a scalloped edge down the two sides and would make an ideal accessory for a wedding or other special occasion. Can be knitted in a wide range of colours – Contact me for details. Hand-knitted in 1-ply Shetland lace wool this stole measures 60” x 16”, features a ‘Cat’s Paw’ filled ‘Diamond’ and has traditional scallops at both ends. It takes approximately 40 hours to complete and would make an ideal accessory for a wedding or other special occasion. Hand-knitted in 2-ply Shetland lace wool, this stole measures 45” x 25”, features the ‘Cat’s Paw’ pattern throughout and takes approximately 35 hours to complete. This stole can be worn in many different ways due to its shape and would make an ideal wedding shawl, evening wrap or anniversary gift. Hand-knitted in 2-ply Shetland lace wool, this light and airy stole measures 45” x 14” and features an original pattern with scallops at both ends and takes approximately 20 hours to complete. It could be worn over an evening dress or used as a scarf as it is not bulky, but will be warm and cosy. 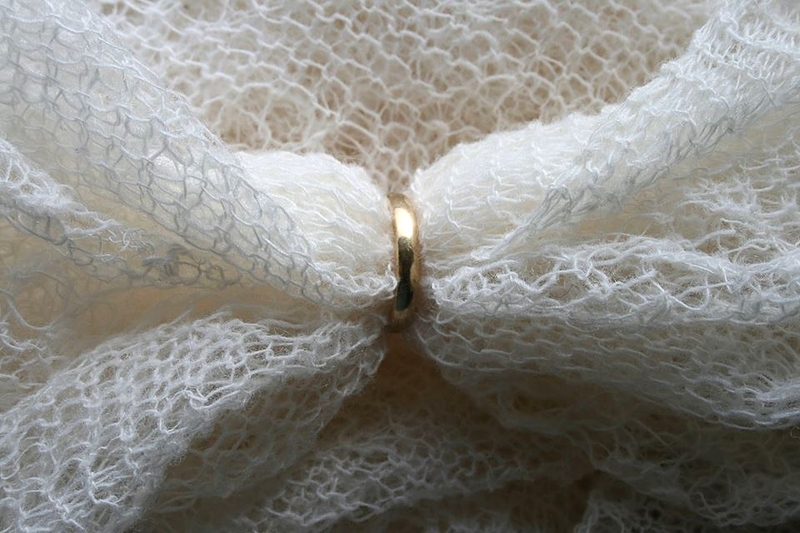 Hand-knitted in 2-ply Shetland lace wool, these ‘dags’ would make an elegant addition to any special outfit and especially as a wedding accessory.